Incidentally, this is the fewest matches a team has had to play before recording a victory since Australia defeated England in what came to be recognised as the first Test match of all time, in 1877. 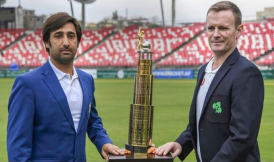 Admittedly, the other nations to be granted test status in the interim have not had a similarly inexperienced opponent to compete against – the record set would also have been identical had Ireland won instead – but regardless of this, if Afghanistan are to nurture and grow a national enthusiasm for Test cricket, an early win can only be a good thing. Aside from the result, however, the most important thing in terms of the development of these two fledgling Test nations is that they both played some impressive cricket over several periods of the match, displaying strengths which will serve them well over their formative years still to come. They both, however, also displayed some obvious weaknesses – unsurprising, given their inexperience at this level of the game, but they will nonetheless need to address these if they wish to prove competitive against the higher-ranked opponents they will face soon. Ireland, of the two teams, came into the match with slightly more pedigree in this regard, having put in a creditable, if unsuccessful, performance against Pakistan in their inaugural test last May, whereas Afghanistan emerged from their initial foray into the Test arena, against India, somewhat chastened. That said, the conditions in which this match was played meant Ireland came in to it as the underdogs and at first this assessment seemed an apt one, as they slid to 69/7 by lunch on the first day and 85/9 soon afterwards as their collective technique against spin was tested and found wanting. The last wicket partnership which followed this collapse, between George Dockrell and Tim Murtagh, was their first positive of the match – it more than doubled their score and showed that Ireland are a team that will fight when things are not going their way, something which a great many of the established Test nations have often failed to do in recent years. That it took their last man (who in the process became the only the eleventh number eleven in history to top-score for his team) to show this fight is perhaps a concern in itself, especially as Murtagh, who will turn 38 this summer, is unlikely to remain an active Test cricketer for too much longer. His partner, Dockrell, is one of the younger generation of Irish cricketers and showed he has a good cricketing head on his shoulders, which bodes well for the future. Having pushed their score to a still disappointing, but less embarrassing, 172 all out, Ireland proceeded to (for the most part) impress with the ball. At first, this description may seem incongruous with what transpired – after all, they can hardly be said to have skittled Afghanistan, who scored 314 and many may disagree with my assessment. But for a team which is used to green, swing-and-seam friendly conditions and has never before played an overseas Test, to bowl a team out for just over 300 in the far more spin-friendly environment of Dehradun qualifies for me as a quietly impressive, though not stunning, performance. A further point in their favour is that visiting spinners generally, despite the assistance on offer, struggle when playing in these conditions for the first time, so the six wickets that their spin attack collected is another positive, although James Cameron-Dow was expensive. Having said all that, it is not strictly the overall bowling performance that impressed me anyway. More to Ireland’s credit is how, after Afghanistan had reached 198-2, then 226-3 (at that point, the best you could reasonably say about Ireland’s bowling was that they hadn’t let the run-rate get too high), they fought back, taking two quick wickets with the second new ball and never really letting any of the remaining batsmen get going – Asghar Afghan, who was already at the crease when the collapse started, did the bulk of the scoring from there on in. In all, the last eight wickets fell for 116 runs (the last seven for 88), showing again that Ireland are a team that can and will fight back from situations which are certainly not impossible, but most definitely unfavourable. Now for the less positive aspect of Ireland’s performance in this match. Before I delve into these, I would like to re-iterate that both Ireland and Afghanistan are only playing in their second match each and you would very much expect them to still have holes in their game at this point – the higher ranked teams have them too, after all. I just feel that this article would not be complete if it didn’t look at both sides of their performances. With that out of the way, where Ireland do need to show improvement, and quickly, is most definitely in their first innings collapses – 130 against Pakistan and now 172 (and it could have been much lower) here. Getting bowled out for those sort of scores will mean that they are constantly chasing the game – given many teams’ apparent aversion to coming back from behind in Test matches, their best chance at beating a top-ranked team will most likely come when they manage to get ahead in the game and stay there. I appreciate, though, that to describe collapsing in the first innings of two matches as a pattern would be an unfair description. Perhaps the fairest thing to say is that, although it is not yet a pattern, Ireland would do well to ensure it does not become one. To be perfectly honest, the above may well be the only genuine negative point Ireland take away from this match, albeit a rather significant one. That is not to say that they performed flawlessly outside of the first-innings collapse – they suffered a mini-collapse in their second innings too, and their bowling was at times unthreatening, but, whilst not to gloss over them, taken in context, these feel more like ‘things that happen sometimes’ (and, to an extent, can be chalked up to conditions) than holes in Ireland’s capability in the game’s longest format. So, on to Afghanistan. The biggest positive for them is, of course, that they won! As I touched upon earlier, this is worth so much more than just that ‘1’ in the (metaphorical, for now) wins column. Afghanistan’s next Test, scheduled to take place in August, is against Zimbabwe who, you would have to say, are the most likely of the established Test teams to find themselves on the receiving end of an Afghanistan victory, and the fact the Afghans already have one such victory to their name will make achieving the second (and hopefully the third, and so on) all the easier now that they have already overcome the mental stumbling block that approaching a maiden victory can often prove to be. If the fear of winning was affecting the Afghanistan team on the fourth morning in Dehradun, however, then they disguised it perfectly. Having started their run chase rather tentatively, perhaps overawed by the reward on offer should they complete their task (and arguably losing the early wicket they did due to this overly cautious approach), they played positively from the outset of the final day and although they got lucky with a simple dropped catch, never crossed the line from positivity to recklessness until, in what turned out the be the final over, a flamboyant charge and some over-optimistic running saw two wickets fall in two balls. Of course by that point nothing could change the course of the game. Both batsmen who fell will be disappointed with the manner of their dismissals and, moreover in this instance, the fact that they were not in the middle at the moment of victory. But the fact that the vast majority of the chase was conducted with such maturity and level-headedness is of great credit to the team. Overjoyed with their achievement as they must undoubtedly be, Afghanistan should, however, not lose sight of the fact that their victory could have been almost totally straightforward and the margin far greater if they had not let their opponents off when they had their foot pressed to Ireland’s throat. At the fall of the ninth wicket in each Irish innings Afghanistan were well on top. Had the tenth followed quickly afterwards in either of those innings, Afghanistan would have, in all likelihood, secured victory before half of the first day’s play was completed or set themselves a paltry chase of 89 runs. In the event, however, they seemed to freeze and become unnecessarily defensive when trying to prize out those final wickets. This passive approach allowed Ireland to first fight their way back into the game, and then claw themselves to a position from which they could fight back, and later to extend their lead to nearly 150 – a target which is far from daunting, but has nonetheless proved too much for the chasing side a number of times in Test history, including on some very famous occasions indeed. As an aside, the two fifty-plus stands that Ireland raised for each of their final wickets marked only the fourth time in test matches that this feat has been achieved. As it happened, Afghanistan were ultimately not punished for their inability to land the killer blow and the damage they had already inflicted – the very fact that their bowling attack is already capable of running through a side is another big plus – proved sufficient to allow their batting to see them home. I have now, I think, covered the most notable aspects of each side’s performance in this match. But to finish by talking about what one team did wrong would not sit well in the context of such an enjoyable and important contest. So I will end instead by saying: Well played both sides, thank you for the past few days, and may your Test match future prove bright!